Dandong Foundry accept small orders, and can produce small batch iron and steel castings. Small batch production is different with large quantity production. Firstly, there are some preliminary costs to develop a new product, because the foundry need to design the gating system, and need to try many times to improve the quality, reduce the defects, so not many foundries would like to accept small orders. Secondly, as for the small orders, the packing costs, transportation costs, and customs charges will be comparatively higher than large batches. As for iron and steel foundries, quantity is a very important. No quantity, no profit. However, our Dandong Foundry is willing to accept small orders, because we have some superiorities. Firstly, we have mature payment, transportation and shipping systems, so small orders will not cause us too many administrative works. Secondly, we have some cooperated pattern workshops, who could help us to make wooden patterns, resin patterns and metal patterns. The wooden and resin patterns could reduce the pattern costs for our clients. Thirdly, we almost produced grey iron, ductile iron and carbon steel castings everyday, so we can produce small batch castings in production of other same material grade castings. 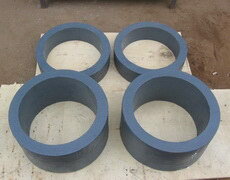 Sometimes, our foundry just produced several pieces of iron or steel castings for our clients. © DANDONG FUDING ENGINEERING MACHINERY CO., LTD. All Rights Reserved.